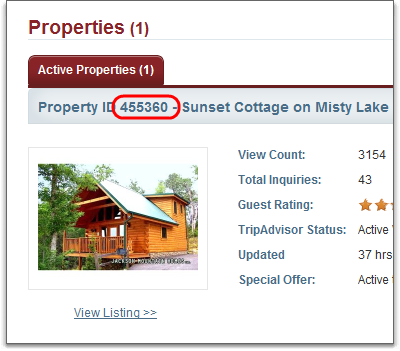 Last week we released an update that allowed users to keep their HomeAway and VRBO calendars up to date. 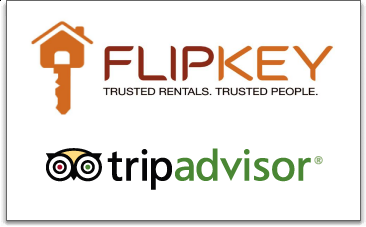 Right on the heels of that release, we've decided to push out an update for FlipKey and TripAdvisor too. If your property is listed on FlipKey or TripAdvisor, OwnerRez can now keep it up to date. The integration for FlipKey is much more straightforward than HomeAway Connect. There is no separate technology or website to register with. You simply enter your FlipKey credentials and Property ID and you're good to go. Open one of your properties in OwnerRez and click on the Calendar Sync tab. You'll notice a new sync for FlipKey. Click the "Set Up Now" button and you'll get a page that will ask you for your FlipKey info. This is the email address and password that you use to login to the FlipKey website. The Property ID is the number listed in your FlipKey account after you've logged in. I'll talk about how to find this information later on. You'll notice an option for testing the settings. By selecting that option, we take a few seconds to check the FlipKey website before saving your information. That ensures that you've entered everything correctly. Once activated, the Calendar Syncs page will show it as successfully running. Under the covers, our system will begin verifying your existing bookings and updating your FlipKey calendar as needed. Every time you change your sync settings, we do the verification process all over again. The verification process only checks bookings from the current month forward so if you add the sync today, only bookings from June 1 forward will be added or updated. 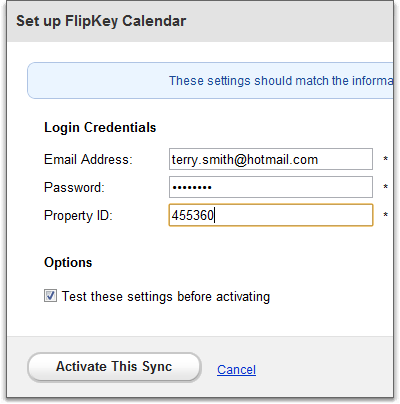 As with the HomeAway Connect integration, the FlipKey synchronization process runs in "near real time". The longest it should ever take for your OwnerRez changes to appear on your FlipKey calendar is about 10 minutes. Where Is My FlipKey Property ID? The "Property ID" that we ask you to supply is the one that FlipKey assigns when you create an account with them or add a new listing to the same account. Each FlipKey account can have multiple listings so it's important that we know which one you want to sync. Login to the FlipKey website. Once inside, you'll see your property listings on the "Dashboard" page. On the bottom half of the page, you'll see a "Properties" section with your properties listed. The title of each property listing will show the ID. If you click the "Switch to Summary View" link, the Property ID will be displayed in the second column under the "FlipKey ID" header. What other listing sites do you use? What other calendars would you like to see kept up to date? What other integration types should OwnerRez support other than calendars? We have our own list of course, but we hope you'll let us know what tools you use so we can factor that into our decision making process. It took me a while to see this one :) but I really like it. I choose to use the FlipKey widget on the property website, so the sync feature if awesome for me. Our integration with FlipKey (ie. our system updating their calendar for you) does indeed still work. The pictures that you see above, in the blog post, are most likely stale. The FlipKey interface changes from time to time. If you can find the property ID of your listing in FlipKey and plug it into our system, our system will keep your FlipKey listings up to date. Every day, we update hundreds of FlipKey calendars with new dates. Martin, I just took a look at the FlipKey website to get you some specific instructions. 2) Look at the property you wish to integrate and notice the "listing # 12345" underneath the title. Each property shows a unique listing #. 3) Take that listing number and plug it into our system where we ask for the Property ID when turning on FlipKey calendar sync.